We are an owner operated, hands on, dedicated company that lives eats and breathes fishing. Once a boy’s dream, now a well-established, very well respected, high-end charter fishing company. We take pride in what we do and our goal is to have every person step foot off our boat with an incredible story to tell and the urge to turn around and go right back out for more. Whether you are looking for a fun family half-day trip in the sun or an all day experience, every single trip with us will be an adventure to remember. We offer a variety of choices from Offshore and Nearshore trolling and bottom fishing trips to overnight swordfish and tuna trips. Don’t forget about our daytime or nighttime shark fishing as well! There is no group too small or too large for us to accommodate. We specialize in multiple boat corporate trips as well as family fun packages. Bring the whole family or your entire work force for a fully guided fishing trip of your custom design. The charter boat Backlash is one of the most sought after charter boats in the Destin fleet. We take pride in our boat and run a very tight ship. The charter boat Backlash is very well maintained and thoroughly cleaned after every trip. We want you to feel right at home while out on the water with us. Please don’t hesitate to ask if you have any special request! Are you staying in one of Destin’s sister cities? 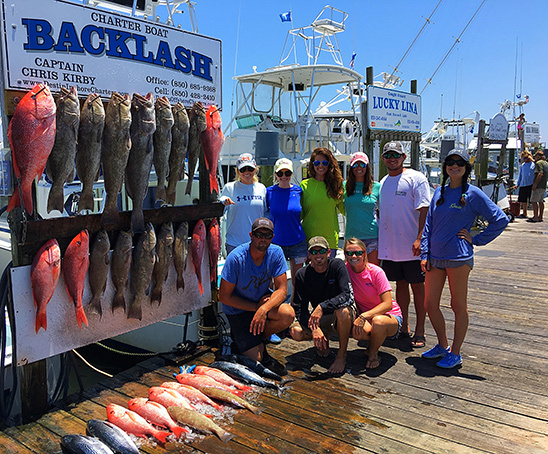 Perhaps you are looking for fishing charters in Seaside and 30A. With Destin being less than 20 miles of many surrounding sister cities this allows us to guide fishing trips to the entire Emerald Coast. Fort Walton Beach, Navarre Beach, San Destin, Seaside, 30A, Miramar Beach, Santa Rosa Beach, Grayton Beach are a short drive from our dock!